On the week, the national gas price average has dropped seven cents to land at $2.56. 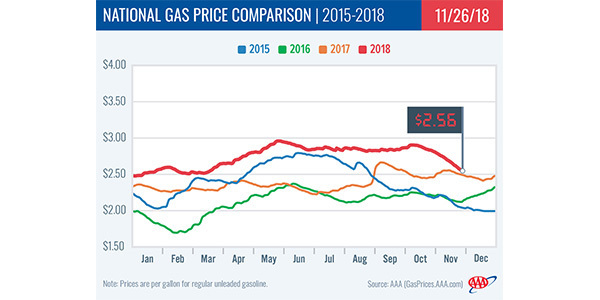 As pump prices steadily decline, they are headed toward some of the cheapest gas prices in 2018, according to the latest data from AAA. 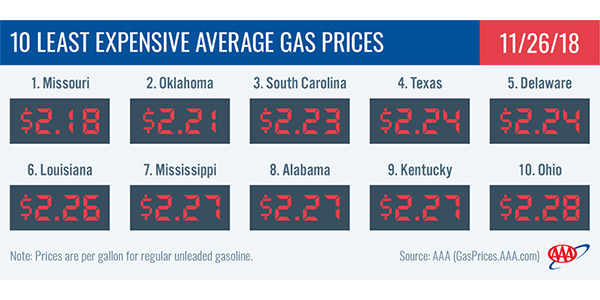 The national average was lowest in January at $2.49 while May brought the most expensive price of $2.97. At the close of Friday’s formal trading session on the NYMEX, WTI dropped $4.21 and settled at $50.42. Oil prices plunged to their lowest point since October 2017 last week as EIA reported that crude inventories continue to build. The latest EIA weekly petroleum report showed that crude inventories grew by 4.9 million bbl to 447 million bbl. Total domestic crude inventories have grown for nine consecutive weeks, contributing to the crude prices dropping further. If this week’s EIA report shows another build, crude prices will likely continue their descent, AAA reports.